Description: A gherkin-shaped body with glistening white skin and five broad double rows of tube-feet are characteristic of this species. 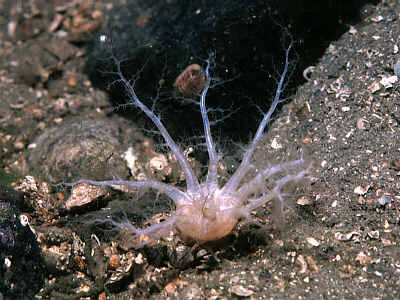 The tentacles are pale brown or pale pink in colour and sparsely-branched. The body is usually covered with particles of shell and is buried in mud. The spicules are flat and irregular with numerous holes. Length up to 10cm by 2cm diameter. Habitat: Lives buried in muddy sediments usually with a high content of dead shells. Distribution: Recorded from the south, west and north-east coasts of the British Isles, in water of 20-1150m depth. Similar Species: Pawsonia saxicola has a similar skin but lives in rocky habitats. Short fat, body with smooth, thick, white skin. 5 double rows of tube-feet. Picton, B.E. & Morrow, C.C. (2016). Paracucumaria hyndmani (Thompson, 1840). [In] Encyclopedia of Marine Life of Britain and Ireland.